On August 27th several members of the Tangi-Tammington Bee Club braved the heat and had a brief crash course in queen rearing and grafting. Several methods were discussed and everyone got to try to graft. We tried to keep it basic and expose members to some general rules of thumb about making splits, cell builders, choosing the right frames, and even marking queens. Some members had never marked a queen so they practiced on worker bees. For a few queen cells a more than adequate swarm box is a nuc with a feeder and 3 frames of honey and pollen(no brood!!). Only 3 frames because you must leave a space for the cell bar. Then shake in more bees than you think it will hold. This is an example of a good pollen frame, again you must assure there is no brood or they will start emergency cells on the frame itself. A decent example of a grafting frame. The key is to graft the smallest (youngest) larvae possible. 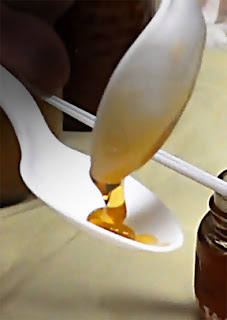 The easiest way to do this is by finding eggs and graft from the cells with royal jelly closest to them. The larvae should be extremely hard to see, if they are easy to see they are likely to large. The strip of cells in the lower right corner is just about right. Both a traditional and a Chinese grafting tool were demonstrated. The Chinese I find much easier for beginners, but they are not very durable so always buy several. This was a practice larvae on a Chinese grafting tool. This one is actually too large, so that gives you an idea of what your looking for. The fruits of our labors. A cell bar with 18 grafted cell cups was placed in our swarm box and 14 of them were made into queens. Not bad for beginners!! And as a bonus for braving the heat a few members came by the next week and picked up ripe cells for Fall splits. All in all a successful day. 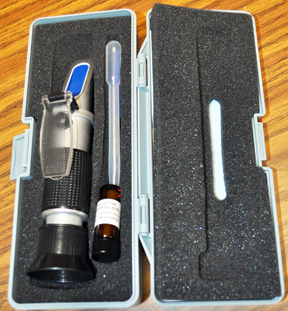 At the September meeting, we had a great hands-on demonstration of how to use a Honey Refractometer to measure the moisture content of honey. Members who brought honey placed a drop of honey onto the refractometer and then looked through the eyepiece to see the reading result indicated by a blue line. 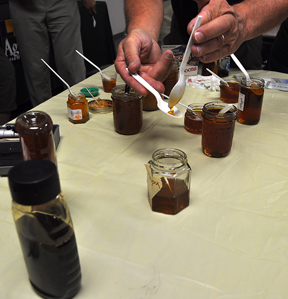 Then, we had a Honey Tasting of any honeys that members brought too share. They were all delicious! 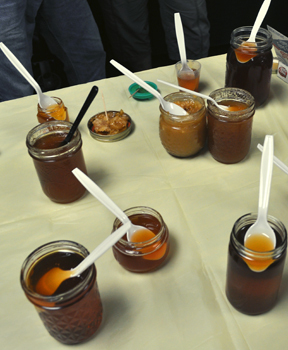 Welcome to the Southeast Louisiana Beekeepers Blog!